An online e-Safety training course specifically written for teachers, schools and the education sector. This e-Safety course introduces online safety and social media, raising awareness of key issues including online risks, dealing with incidents and how to use social media for parental engagement, teaching and learning. I am the Headteacher of a Primary School and will be using this training with all of my staff, including the Governors, and it will be an essential part of our updated e-safety policy. Ofsted, I am sure, will be impressed with it and this will help us in our journey of improvement. Thank you. As a teacher, I have taken the professional decision to not use any social networking sites. The downside is not having the basic knowledge and understanding of how the sites work. This course has enlightened me, so was very worthwhile. I have four children aged under 10 and the course has given me valuable resources and information for keeping them as safe as I can. What do I need to do about other aspects of safeguarding training, such as the Prevent duty and child protection? 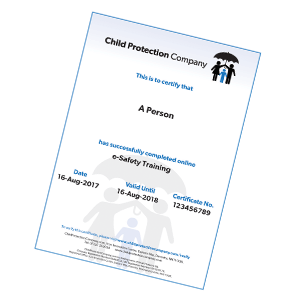 We have a range of separate courses that cover all aspects of child protection and Prevent training. We also offer our Safeguarding in Education online training course, which is essentially 3 courses in 1, covering child protection and safeguarding from concern to referral, online safety and Prevent training. Who is this safeguarding training course suitable for? This e-safety training course has been written to meet the Ofsted and equivalent guidelines for e-Safety in a school or education environment, therefore it is suitable for staff who work in education at all levels. We also have a separate e-Safety for Parents online training course, which offers an introduction to online safety for parents and carers. I work in England/Scotland/Wales/Northern Ireland. Is this safeguarding course suitable for me? The information provided in our e-Safety training course is suitable for staff in all areas of the United Kingdom. The videos are very, very good. In my opinion just the right content and duration to hold interest ... Lou is a star. Upon successful completion of the course, you’ll be able to download a personalised training course certificate valid for 1 year. This course is designed to introduce you to the fundamentals of online safety. Through a series of modules, you will increase your awareness of online safety and how this relates to the home and school environments. You will understand more about the risks children and young people can be potentially exposed to when online, and some of the issues surrounding digital technologies. There will also be information on what you should be reporting and to whom. Module 1- What is Online Safety? In the first module of the course we will look at what we actually mean by online safety. Certainly, there are many benefits to the online society, but the internet and areas such as online gaming and social media can also have a level of danger that we need to be aware of. The internet is one of the most important advances in human history but it does not come in a ‘lite’ or ‘child friendly’ version, so we need to empower our children to know the correct way to use it. By the end of this module, you will have looked at the meaning of online safety, the importance of raising awareness and the importance of governance and safeguarding. The school and home environments present different issues in terms of safeguarding our children when online. At home, technology is now regularly used by younger children as a source of entertainment and social interaction, and where schools will have a policy of online filters and other protections, outside of school hours this may not be the case. This module introduces the idea of appropriateness and context in relation to online safety. By the end of the module, you will have considered how ‘legal’ may not be the only benchmark to apply, and how age, location and other factors may be a part of deciding what constitutes suitable content. Module 3 - What is Risk? This short module acts as a brief reminder of the relationship between risk and harm. Module 4 - What Are the Risks to Children? This section introduces some of the risks to children in the online environment. The content will cover areas such as the internet predator, online bullying (commonly known as cyberbullying), sexting and other issues. The module uses high-profile, real-world incidents where the safeguarding processes we introduce you to failed to work, and these examples will help you to place the risk into context. By the end of the module, you will have an overview of the techniques used to groom young people online and the legal position surrounding issues such as sexting and online bullying. When it comes to online safety, educating and empowering children with the knowledge to recognise danger is likely to have the greatest impact on their safety. Simply forbidding a child to do something is unlikely to have much effect, but giving them the opportunity to recognise and report probably will. This module looks at the basic, easy to teach rules that could shape a child’s response to a dangerous situation. While many sites have age recommendations, it is a sad fact that these are often ignored and evading them is an easy matter for a digital native child. By the end of this module, you will have looked at the basic guidance that can be offered to children and young people to help them see the inherent danger in certain actions and responses when online. Extremist groups are known to use the internet and social media to spread propaganda. Despite the attempts by some social media platforms to identify and remove accounts that support or promote terror and extremism, the problem persists. Young people and children are particularly vulnerable to these groups, and it is important that safeguarding includes anti-radicalisation efforts. This module is a basic introduction to anti-radicalisation and the Government’s counter-terrorism Prevent duty of care. The effect of video games on the behaviour of children has been the subject of many studies and even more media speculation over the years. While gaming may make good copy for the newspapers, it is important that we focus on real issues and dangers, and understand where the rhetoric ends and the real problems begin. This module attempts to put a little perspective on the danger games present, and offers a rational approach to safety when using the chat feature of some games. Social media and the video-based platform YouTube have become part of the social world for many children and almost all teenagers. Despite the age limit required to have accounts on these online communities, many younger children now use social platforms to keep in touch with friends and talk to the world. This module will introduce the main social media sites and discuss how each one is used. The module then goes on to look at other issues, such as the proliferation of false news. By the end of this module, you will have an overview of the main social media and video platforms and how they appeal to their users. The module also looks at other possible issues with mobile devices, such as accessing unsuitable content, breaking copyright laws and the growing problem of false postings and fake news. It is vital that online safety-related incidents are reported quickly and to the right people. This module details what you should and should not do if an incident occurs. By the end of this module, you will have a clear idea of the path to follow if you need to report an incident. You will also be able to avoid accidentally infringing the law and what to record as evidence. The final module in the course looks at the importance of Keeping Children Safe in Education (KCSiE) and how your online safety policy should be integrated with your curriculum and staff strategy.